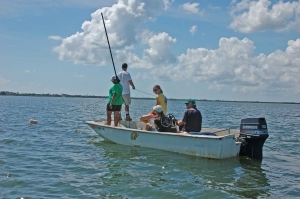 Summary: FastLoc GPS/Argos Satellite tags will be used to track the long-term movements of juvenile green turtles in the Indian River Lagoon System. Their movement patterns will help us to identify the areas of the central region of the Indian River Lagoon utilized as developmental habitat by this endangered species. This knowledge will then enable us to design projects to quantify the relative abundance of green turtles at within those habitats, and determine how those habitats are utilized. Results: Although the tags deployed on Dylan and Jamie transmitted GPS positions for only 37 and 47 days respectively, those data showed that both turtles stayed within the central region of the Indian River Lagoon, which in itself is a significant contribution to our understanding of habitat utilization by this species. These same data would have been both more difficult to obtain and much more costly using towed floats or sonic tags. That would require the purchase of a selfcontained vessel (head, galley, bunk space) at least 10 m in length, and at least 3 people to man the vessel 24 hours a day, seven days per week. In addition there would be the operating costs of the vessel and provisions for the crew.